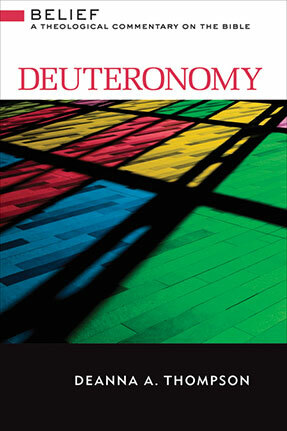 Deuteronomy: A Theological Commentary on the Bible In this fresh commentary, Deanna A. Thompson makes this important Old Testament book come to life. Recounting God’s foundational relationship with Israel, Deuteronomy is set in the form of Moses’ speeches to Israel just before entry into the promised land. Its instructions in the form of God’s law provide the structure of the life that God wants for the people of Israel. Although this key Old Testament book is occasionally overlooked by Christians, Deuteronomy serves as an essential passing down to the next generations the fundamentals of faith as well as the parameters of life lived in accord with God’s promises. Thompson provides theological perspectives on these vital themes and shows how they have lasting significance for Christians living in today’s world. Thompson’s sensitivity to the Jewish context and heritage and her insights into Deuteronomy’s importance for Christian communities make this commentary an especially valuable resource for today’s preacher and teacher. “I am so very honored to be here with all of you to receive this award. I’m still pinching myself that this theologian actually wrote a commentary on Deuteronomy and to be honored for doing so is reason to pinch myself even more. As many of you know, scholars are encouraged to have clear research trajectories where each scholarly project builds on the previous one. My scholarly path continues to resist such logical progression. Because of my participation in several working groups, I get invited to contribute to others’ projects. Rather than viewing these invitations as disruptions of my own attempts at a seamless trajectory of scholarship, I’ve come to embrace them as nudgings of the Spirit to grow and be stretched in unexpected ways. Which brings me to how I came to write a commentary on the book of Deuteronomy. Several religious presses have recently recruited theologians to do what it is we used to do—that is, write commentary on scripture. This recruitment of theologians to do scriptural interpretation is not a knock on biblical scholars. The move is rather an acknowledgement that the split over the last 150 years between biblical studies and theology sometimes encourages an artificial distance between the two. Westminster John Knox is among the presses creating a new series of biblical commentaries written by theologians, drawing of course on current biblical scholarship while focusing on the theological themes raised in scripture. About seven years ago I received a letter from one of the series editors inviting me to participate in the WJK series. She and I are part of a Constructive Theological Workgroup that collaborates on a host of projects, and our work there served as the basis for my invitation. I was really honored to be asked to join a stellar list of scholars (Stephanie Paulsell, Willie James Jennings, Don Saliers). But the letter was not just a general invitation to participate; it invited me to write the commentary on Deuteronomy. I have to admit that even as I was honored to be asked, the book chosen for me gave me pause: Deuteronomy? Romans, perhaps, but Deuteronomy? I wasn’t so sure.